This beautiful painting is one of such works, depicting the ‘Quai de Bourbon’ in the fourth arrondissment of Paris. This beautiful painting is one of such works, depicting the ‘Quai de Bourbon’ in the fourth arrondissment of Paris. The quay itself was built in 1614 by the Bourbon family and today remains a beautiful Parisian landmark, on the right bank of the River Seine. 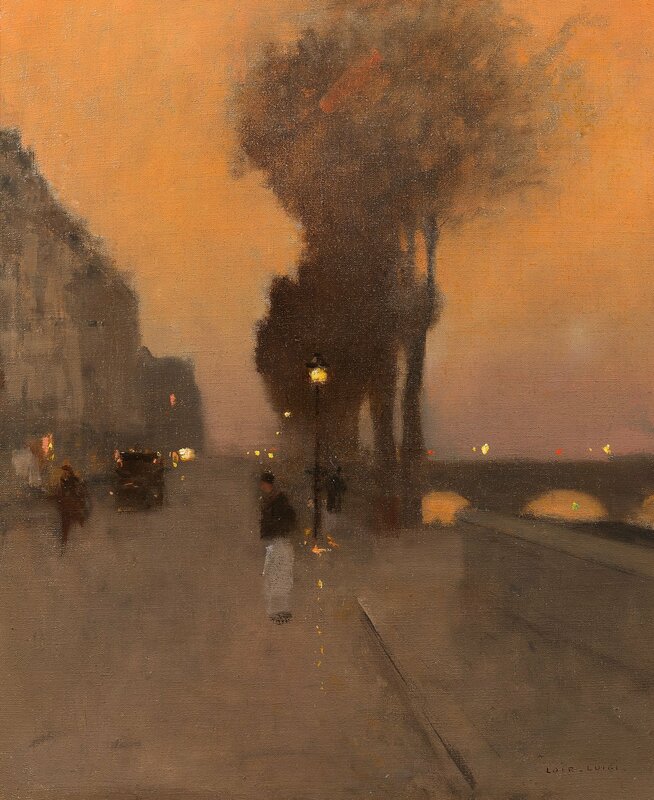 The use of yellow hues throughout this scene create a sense of the warm evening light found just after sunset in the Parisian capital, whilst at the same time it contrasts against the dark trees and figures, creating a romantic atmosphere that Loir was much admired for. Works such as this boosted Loir’s career and his reputation even further, so much so that in 1879 he was awarded the Bronze medal from as Exposant Fidèle des Artistes Français in Paris. A little methodical perhaps, Loir concentrated exclusively on painting views of Paris, at the time the centre of the world. In these works, Loir caught and expressed the many faces of the city of lights, at different times of the day. His craftsmanship and attention to detail led to his election as the official painter of the Boulevards of Paris.